The NCR Columbus terminals offer market leading design, reliability and durability. The fan-less construction ensures a long service life. The Columbus comes with an all-inclusive, no-hassle warranty, that also covers parts subject to wear and tear and can be extended for up to 6 years. Columbus800 and our Orderman7 handheld make the perfect team. They speak the same design language and are perfectly in sync in terms of technology. Thanks to the Power over Ethernet (PoE) interface, Orderman Secure Radio can connect directly to Columbus800. The stationary POS system thus, at the turn of a hand, becomes a mobile POS solution, also known as a wireless ordering system. The power supply can be integrated into the stand of the POS terminal, saving space and offering a stylish design. All power, data & communication cables can be neatly routed & stored through the CableLock System providing a clear workspace. The Columbus 800 offers both energy saving and a long lasting LED backlight. Now available in both 12” & 15” formats with the same features across the range. The Columbus800 POS system is equipped with the latest, intuitive, capacitive touch technology. With Columbus800 comes great flexibility. There are multiple interfaces for printers, cash drawer, Orderman Secure Radio, powered USB and many more, ensure a long lifespan of the system with future expansion possibilities. All NCR Orderman products are designed and built to meet the tough requirements of the hospitality industry. They are extraordinarily durable and reliable. The screen is dust- and water-resistant, requiring only a dry, soft cloth to wipe it down for a perfect result. Exceptional Products Outstanding Service. 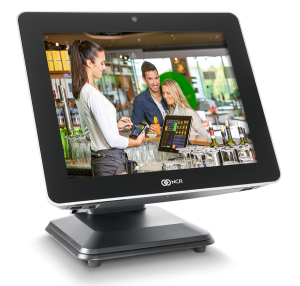 Lapsley Ltd is a specialist provider of EPoS systems to both the retail and hospitality industries. Copyright Lapsleys Limited 2019. All Rights Reserved. Developed by Untangled Web.ltd.